The OPI Miss Universe collection features four sparkling shades ranging from full-on glitterbomb (Crown Me Already) to a relatively more demure pink (Congeniality is my Middle Name). 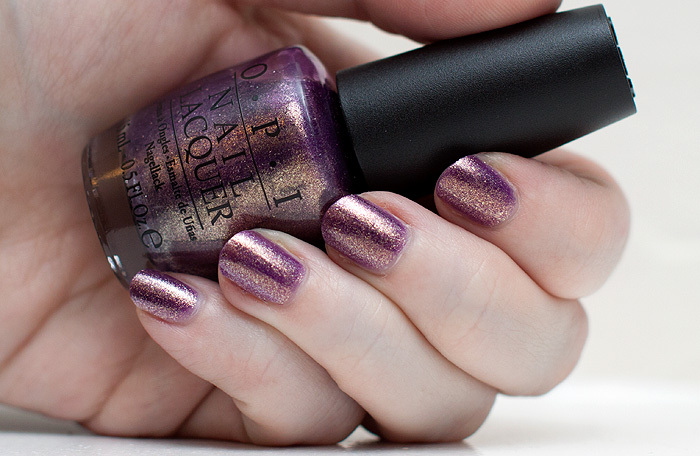 From the collection, I’m wearing It’s My Year, an exquisite purple/gold shimmer (or is it a foil?) that stopped 3 people dead in their tracks today as they demanded to know what was on my nails! It applies smoothly, if a little sheer thus needing 3 coats to reach opacity. It gave me no application issues and simply SINGS when it catches the light. I wish OPI would release a full collection of variations on this theme, that would make my year. Could this be any mroe GORGEOUS?!?!!? This is too pretty! Love the shade SO much. Gorgeous Colour – like sparkling wine! What a beautiful colour! I love it! Gorgeous! I haven’t seen anything similar elsewhere. This is gorgeous! I don’t have anything similar to this I think I need to buy this right now! Oh me Oh my!! That is stunning!! Want want want!! Oh! I was just umming and ahhing over that colour on Asos, and I think you’ve convinced me to get it. What a gorgeous and unusual colour. Oh god. Like I need another OPI nail polish to add to my bourgeoning collection. And yet… I NEED THIS. I bought this today at Ulta! And I got the glitterbomb “Crown Me Already!” which is awesome to layer over other colors. I wish they did a whole collection like “It’s My Year” also, but I always like how they have varying finishes/textures/whatever in every collection they do. I just discovered your blog today and this was the first post I saw. I just purchased two nail polishes online by China Glaze- For Audrey (a Tiffany Blue) and Over the Rainbow (a metallic/rainbow fine glitter white) so I *thought* I had filled my nail polish shopping quota, but NO I saw this post, loved the polish so much I had to go on and buy it right away! Love, love, love this color….and this blog now too!